In order to screen traffic and crowd during the Kumbh Mela that will begin next year, the district and the civic management are taking measures to set up screening of vehicle flow 100 km from Nashik. Crowd management and traffic will be of prime concern to city and district civic administration Nashik. The main concern for district as well as the Nashik city civic administration will be managing the crowd and traffic of approximately 75 lakh pilgrims who are likely to visit the Kumbh Mela in Nashik. The professionals from the Mumbai Metropolitan Region Development Authority (MMRDA) have assisted in preparing a plan for the traffic simulation. During the Kumbh Mela, a check on the flow of vehicles 100 km on 8 roads from Nashik city is being planned. 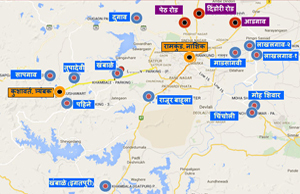 At 7 different locations on these roads, the Maharashtra State Road Transport Corporation (MSRTC), the Nashik Municipal Corporation (NMC) and other departments would appoint official teams which will keep a watch on the number of vehicles entering the city providing an estimation of people that would visit the city said an official of NMC. The teams will be set up on the Nashik-Peth Road, Nashik Mumbai Agra Highway, Nashik-Dhule Agra highway, Nashik-Aurangabad Road, Nashik-Gangapur Road, Nashik-Dindori Road, Nashik-Aurangabad Road, Nashik Trimbak Road and Nashik-Sinnar Road. The police, the district and the civic administration would be helped by this in making advance plans as it takes around one and a half hours to reach Nashik from these locations. So we will get sufficient time to deal with the crowd and the traffic flow said the official. 10 external positions have been provided for parking of vehicles that will come from various places outside Nashik. 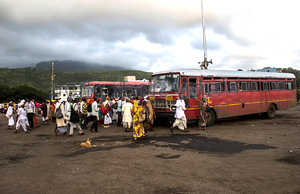 The MSRTC buses will bring the devotees from theses parking areas to the kumbh mela.Hoisting of the simhastha flag marks the beginning of the Kumbh Mela which is planned to begin on 14 July 2015 in Nashik. 29th August will be the day when the first shahi snan i.e. the holy dip will take place. The second shahi snan will be on 13th September and the third shahi snan will be on the 18th September. 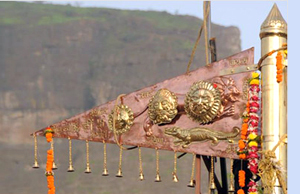 The Kumbh Mela will end on 11th August 2016 which will be marked by the lowering of the simhastha flag.